High sensitivity (36dB gain), tested for low harmonic distortion and flat frequency response (1dB down at 40Hz, flat past 30kHz). It was intended for recording outdoors, with the electret element in a rubber washer, within a 15mm diameter PVC tube, araldite at one end to waterproof it, and with some foam inserted at the other end; foam end points down of course. It worked well. 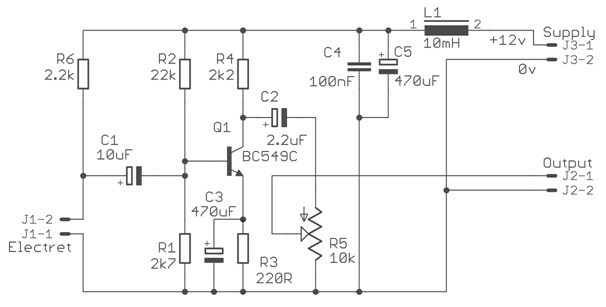 Design is optimised for 12v (a couple of milliamps) but 9v is probably still ok results.